Jacklin Seed a Post Falls company that processes and markets seed for Bluegrass growers has made the announcement that they plan to close their Post Falls plant and move operations to Scooteny Springs Seed operation outside of Othello,Wa . The Scooteney Springs plant will switch to the Jacklin Seed name once the move is made. Jacklin Seed while not the largest employer is the Inland Northwest has had a huge presence in the local community both business wise and on a community involvement level. Jacklin was acquired in 1997 by a larger firm, Boise based Simplot. Simplot want to relocate it's Jacklin Seed branch to be better positioned to the bluegrass seed market in Central Washington. Due to aggressive development in the last several years Bluegrass fields have turned quite rare in Post Falls / Rathdrum Prairie area. 25 employees of the Post Falls Jacklin Seed operation will not be transitioned to the new plant and an additional 40 employees will stay on but will be transitioned into a new office somewhere in the Spokane area. Jacklin Seed has operated in Post Falls since 1936 and at it's current location at the end of Riversbend Ave. since 1977. Jacklin / Simplot's site will likely go up for sale after the closure due to it site being in high demand,along the Spokane River and by the new I-90 / Beck Rd/ W. Pointe Pkwy interchange that provides tourists and locals a more direct connection into the Cabela's store area. The closure is not expected for sometime however as the company wanted to notify workers of the closure with enough time to fine a new job. No date has been set yet however it will be over a year. There is a new way to get to know what's going on with local business in Spokane. That new way is radio show that signed on the air for the first time last Wed. called Business Talks. The Business Talks radio show is aired on Spokane's AM 630 KTRW radio station live every Wednesday afternoon at 12:30 pm. The show broadcasts from inside of the Scratch Resturant on W. 1st Ave in Downtown Spokane. Business Talks is hosted by a pair that have had their name's in the Spokane media scene for some time, Kent Adams and Tom McArthur . The show is meant to provide an outlet for local businesses to share their businesses story to the community. While it's not 100% confirmed as of yet,many of my sources say that a Golden Corral Grill & Buffet will open in 2013 in Coeur d' Alene. 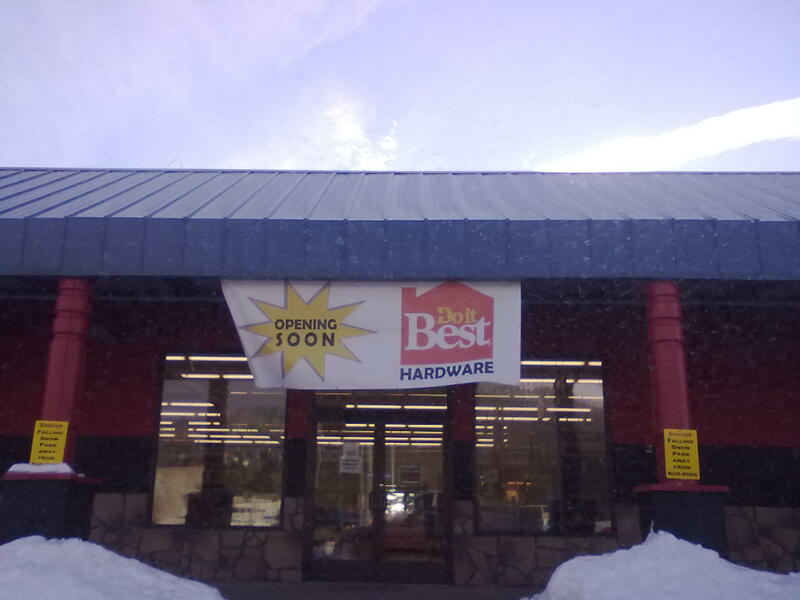 The Golden Corral restaurant chain will take the space along US 95 near Neider Ave. just north of the Super Supplements/ Northwest Pizza Company shopping plaza. A self storage business that had occupied the site is already in the process of being torn down. Golden Corral is a popular national chain of buffet style restaurants based out of North Carolina. Currently they operate 1 location in the Spokane/ Coeur d' Alene market at 7117 N. Division St in North Spokane. Dickey's Barbecue Pit , a mostly franchised chain of some 140+ locations in 43 US states will open it's 6th Washington State location soon. And that new location will be right here in Spokane. Dickey's BBQ is a Texas based chain and plans to open at 12628 N Division St. which was formerly Camino Real Mexican Restaurant in North Spokane's Wandermere area. More specifically by the corner of N. Division and Falwell Rd. Dickey's Barbecue Pit's menu is much of what you would expect of a BBQ establishment. Also included are BBQ sandwiches. The new location will offer catering. A brand new 4 story , 51 unit apartment building has opened it's doors to the first of many new tenants in Downtown Spokane. And that news alone would be enough to catch a few eyes but it's who the new apartment building is intended for it's what's commanding much positive attention. The new building called, Father Bach Haven will house Spokane's chronically homeless. Homelessness is a very serious issue for Downtown Spokane,especially during the cold winter months so this new building opening is a much needed relief for some. Father Bach Haven is made up of 30 studio apartments and 20 1 bedroom apartments. All units come equipped with built in furniture and to building also offers on site social services. To rent an apartment at Father Bach Haven tenants must make under 13,000 a year and pay rent that is set on a sliding scale that is dependent upon the tenants income. Rents are set around 30% of the tenants income.Already more applications then there are apartments have been filed but those down on their luck are still welcome to apply. Father Bach Haven is located in Downtown Spokane at 108 S. State St. next door to the House of Charity shelter. The apartments are venture of the non profit Catholic Charities Spokane who also run the House of Charity. The new Spokane Valley location of Bumpers Family Fun Center will be much larger then the original one at Northtown Mall. The new location is 77,000 square feet and will include a few new features. Those new features include a full service restaurant and a 24 lane bowling alley which will be in suite b of the building and will use the name Gutters . Also the new Spokane Valley Bumpers will a mini golf course and a bumper car area.Not all features are open as of yet but are coming. After many years in the basement of the Northtown Mall, Bumpers Family Fun Center,has officially closed in the mall and relocated to Spokane Valley. Bumpers opened on December 20th at the former home of Players & Spectators at 12828 E. Sprague Ave. Spokane Valley in between Pines Rd. and McDonald Rd. New cross stitch store now open at 9212 E. Montgomery Ave, Spokane Valley. in Spokane. Site plans call for 61 new apartments to be built. Beyond Beads which was at 12019 E. Sprague Ave in Spokane Valley has closed. With the opening of the new US 95 freeway and interchange directly out front of the park and a increase in visitors over the past few seasons,2013 should be a huge year for Silverwood Theme Park north of Coeur d' Alene. And,whatever this new ride is, it will not be in any other amusement parks in the United States. The official announcement is expected on Jan. 22nd. Check back with Inland Northwest Business Watch as i'll post as soon as I know. In recent history Spokane has lacked a major country bar. But after much speculation The Roadhouse at 20 N. Raymond Rd ( the former Hotteez night club building ) has filled that void. The Roadhouse actually opened to the public in November and the owner ,Fred Lopez is the same person that's also behind The Ref Sports Bar in former Owens Auction Gallery space a few blocks west of The Roadhouse just off of Sprague Ave. in Spokane Valley. The building has undergone a complete remodel and also now offers a food menu as well as drinks. Daily food and drink specials are offered. The Roadhouse features live music and a DJ as well as a mechanical bull. The new bar and restaurant is open 4pm to 2am and has several tv's for watching virtually any sports game. It's a sad day to report the end of Rosa's Italian Market & Deli across from Post Falls City Hall on 4th St in "Downtown" Post Falls. Rosa's opened in 2009 but quickly became a favorite little restaurant of many in the Spokane and Coeur d' Alene region. The owner also held an annual North Idaho Italian Festival in the City Center area by the restaurant. No word on that event's fate. I learned from my doctor that I wont be able to continue the long hours on my feet that it requires of me to run the store. I never really recovered from the injuries to my foot/ankle from 2011 and now find that I need more surgery, which I will have done in the beginning of March. I will still run the wine tasting and apps classes till the end of February for the Groupon customers. I will also run a couple more cooking classes for my "stragglers" on a private basis, who need to make up a class. Catering on a limited basis will be an option for those of you who just can't live without my cooking. I just need enough notice, so please call and leave me a message. I will keep this page up to post recipes, information on classes and catering options for the holidays throughout the year. Please don't be sad for me. I was able to live my dream for 4 years and during that time won numerous awards and recognition for the store and our food, but most importantly made many new friends, most who became family. I don't have enough space to thank everyone who has traveled this journey with me, you know who you are and I love you. A new and growing trend in Yoga has arrived here in the Coeur d' Alene area , That trend is Hot Yoga. Hot Yoga is exactly as it sounds, relaxing yoga practiced in a room with a hot temperature ( 75 to 95 degrees). The new studio bringing hot yoga to the local area is called The Yoga Room CDA and will be located nearby the Coeur d' Alene Airport in Hayden at 10183 N Aero Dr. Suite 7 . The Yoga Room will offer yoga classes with a monthly fee or a drop in rate. Also The Yoga Room plans to partner with Real Life Ministries by opening there studio to members of church groups for free. The Yoga Room will celebrate their Grand Opening on January 15th 2013. The Spokane and Coeur d' Alene area's medical community is poised to grow significantly in 2013 with several major new medical projects projected to open this year. In fact one of the local economies strongest sectors will undoubtedly be health care with all that is new and improved ,and as baby boomers continue to reach their retirement age. To add to the local health care sector growth comes last months announcement of a new rehabilitation hospital that will be built in Post Falls. The new hospital will be called the Rehabilitation Hospital of the Northwest and will be constructed on vacant land to the east of the existing Northern Idaho Advanced Care Hospital on Cecil Rd,near Mullan Ave. The project is a joint venture between Kootenai Health and New Mexico based Earnest Health,who is also the operator of the Advanced Care Hospital next door. The new rehab hospital is set to cost 11 million dollars to build and will open in the fall of 2013. Once open the Rehabilitation Hospital of the Northwest will have 30 patient beds and approximately 120 new employees in a brand new 33,000 square foot structure. The ground breaking ceremony took place back on Dec. 12th and construction is projected to begin sometime in the spring.